(From left to right) Genevieve Johnson, Chris Johnson, Bob Wallace & Roger Payne onboard the RV Odyssey pulling into Boston Harbor. Click here to listen to a special news report from Athena Desai of WBUR in Boston about the Voyage coming home. We did it! The Voyage comes home to Boston. This is Genevieve Johnson speaking to you from the Odyssey for the final time. At 10am on August 17, 2005, the Research Vessel Odyssey sailed into Boston harbor after almost five and a half years studying sperm whales and ocean pollution on all oceans around the world. The spray of a Boston fireboat marked the return of the Odyssey, leading the vessel and her weary but elated crew to the Moakley Courthouse dock where an eager crowd gathered in anticipation of her arrival. Three of the crewmembers, Captain Bob Wallace and Chris and Genevieve Johnson, were onboard for the entire voyage. In many respects it rivaled the historic scientific and exploration expeditions of the last two centuries: voyages of incredible ambition, years at sea, separation from family and friends, extreme weather conditions, minimal pay and as stated in an advertisement by Earnest Shakleton when searching for crew to accompany him to the south pole onboard the Endurance, "success and safe return unlikely". However, we succeeded in many ways above and beyond what we hoped for. The crew of the Odyssey collected over 900 tissue samples from sperm whales in all of the world's oceans; this dataset will reveal the first ever baseline on ocean pollution. The crew visited schools, dispersed education materials and spoke to tens of thousands of students, teachers, government officials and the general public in each of the twenty countries we worked in. We introduced whales and ocean issues into local curriculums, we influenced local environmental policy and we trained local scientists. We slowly but steadily made our way around the world due in large part to the work of over 100 volunteers who joined us throughout the expedition. Dr. Roger Payne and Iain Kerr joined Odyssey for her return home. 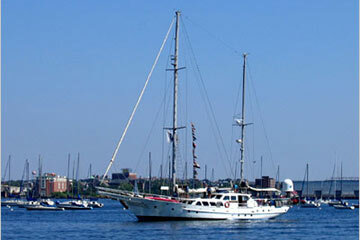 As we sailed toward the dock in Boston Harbor, most of us were overwhelmed. It was hard to digest a moment we anticipated for many months. As we lowered the mainsail and prepared the lines for the final time, we stood side by side along the starboard handrail. Local reporters and camera crews flooded the dock, but we each searched the crowd for the familiar faces of family and friends. Some held up signs welcoming families home after this remarkable journey. It's good to be home. As it approached the Moakley courthouse dock in Boston, the crew of the Odyssey takes down it main sail for the last time on the Voyage. Make sure to follow the Ocean Alliance website for news of the scientific results of this epic expedition over the coming months and the plans for the next Voyage due to begin in 2007. We would like to thank and congratulate all of the donors, volunteers and staff that helped made this expedition possible over the years. What did the crew report on one year ago in the Meditteranean Sea? Two years ago in Sri Lanka? Three years ago in the Seychelles? Four years ago in Australia? Odyssey log written by Genevieve & Chris Johnson. The crew of the Odyssey would also like to thank Cindy Johanson and all of the staff at PBS Interactive for their assistance and support over the years in the production of this website. In addition, we would like to thank Athena Desai of WBUR for the use of her report.